Private family recipes are those that we cling to and sometimes hesitate to share. I know that I have beloved friends who cannot part with their sacred family recipes. And that’s OK! I get that. However, this is a family recipe that I know came from someone else. So why should I hoard it just for my family alone? Are these mashed potatoes Italian; well, probably not . 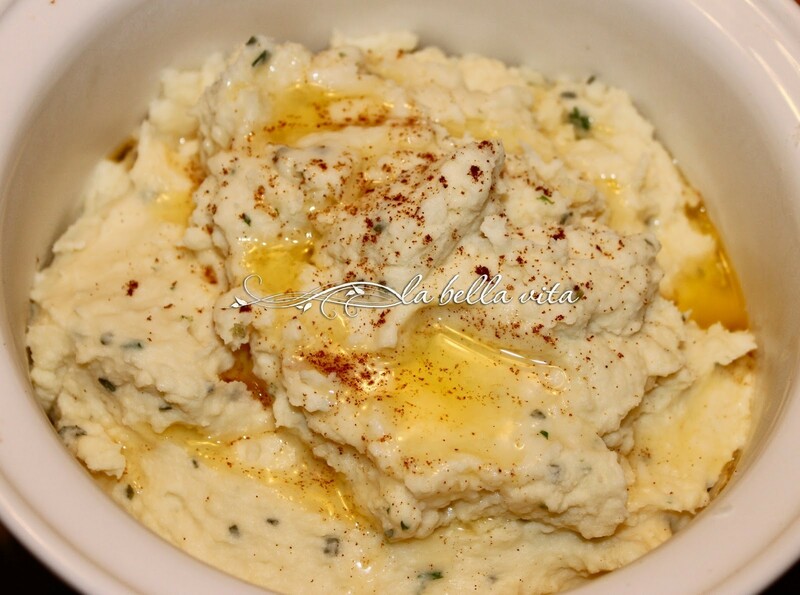 . . but with the fresh garlic included, these American mashed potatoes come pretty close! Besides, I’m American and not just Italian and I love all of our country’s American food traditions for Thanksgiving! And who doesn’t? This is one of those recipes that one wants to keep within the family. But in the spirit of giving, I’m sharing this outstanding recipe with all of you. This recipe is from someone in my family and is a very old, cherished, and absolutely amazing recipe. It is always served at holidays in my family on which we smother with either more sweet creamy butter or gravy (when it is served for Thanksgiving). No matter which way anyone chooses to enjoy these potatoes, they are perfect, simply perfect each and every time! One of the secrets to perfect mashed potatoes is to first crush up the cooked potatoes with a hand-held potato masher which is not always easy to find, so I’ve added the link to purchase one online. It’s OK though to use a good quality hand-held mixer too, just remember not to over-beat the potatoes. I use Cuisinart products and have since forever, so LOOK WHAT I FOUND on Amazon if you need an electric hand-held mixer or want to gift one: Cuisinart HM 50 Advantage Advantage Electric Hand-Mixer. Your family and friends will beg you to share the recipe! And isn’t that one of the best compliments??? From my family to yours, I hope that you enjoy this delicious recipe and that you have the most blessed Thanksgiving! This private family recipe was given to me by my mother-in-law and is absolutely over-the-top delicious. These potatoes grace our table for each and every holiday celebration meal. I’m sharing it with you because it is very special and oh so yummy. If you prepare it, please write back and let me know what you think! Enjoy and Bon Appetito! 4 lbs. Idaho russet potatoes (about 12 medium-sized potatoes), PEELED. Add the potatoes and boil for 15 minutes or until a fork can be inserted easily. Drain the water from the boiled, cooked potatoes. Place potatoes in a very large bowl and mash with an electric, hand-held beater. Beat in the sour cream, sea salt, black pepper, and garlic. Beat at high speed until smooth and creamy! Stir in the fresh chopped chives. Spoon into a lightly oil-sprayed large baking dish. Slice the butter and place the slices upright randomly all over the top of the potatoes. Lightly sprinkle the top of the potatoes and butter slices with ground paprika. Bake in a 350 (F) oven for 30 minutes or until lightly golden on top and the potatoes are heated all the way through. 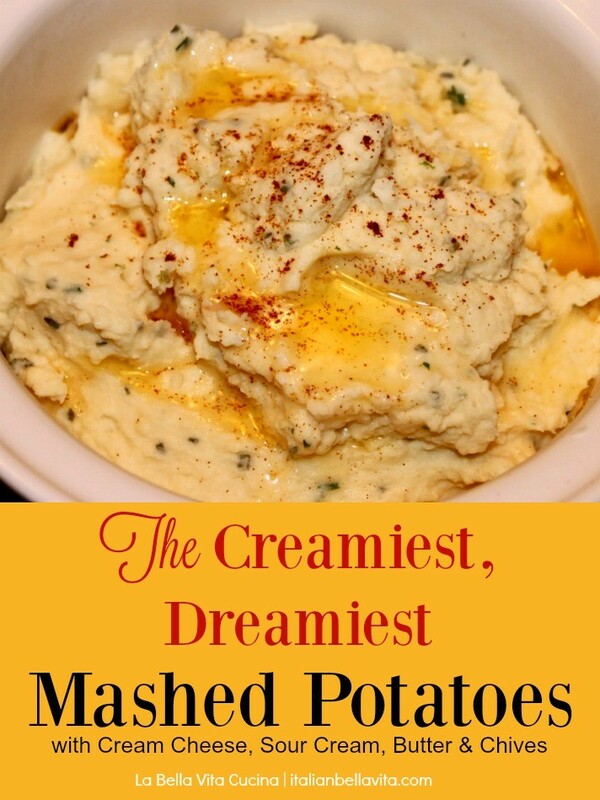 For my family, this is LITERALLY the best, most creamiest, dreamiest PERFECT mashed potato recipe! We’re honored to share our treasured, time-tested family recipes with ‘amore’ from our cucina and acreage to you! 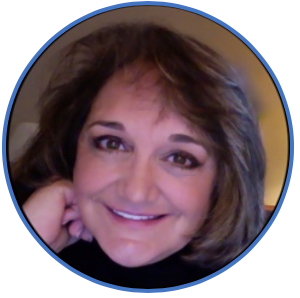 Click here: La Bella Vita Cucina to get new recipes, travel tips and gardening tips straight into your inbox! Previous Post: « Ruth’s Chris Steakhouse Chopped Salad — Copycat Recipe is SO DELICIOUS!! It looks indeed very very creamy, Roz. Thanks Angie! One of our all-time favorite family recipes! Have a Happy Thanksgiving!! Thanks for sharing it Roz I like the addition of the garlic and the zing the sour cream will ad – now on our try list. If you make these fabulous potatoes, let me know what you think, Larry! It’s a keeper in our home! These mashed potatoes look delicious. I know a lot of people who won’t give out family recipes and I don’t understand that because I like sharing all of mine. Most of my family recipes take too much time to make, so I’m the only one that really makes them. Anyhow, have a Happy Thanksgiving. I agree with you Annamaria, about sharing family recipes! We LOVE mashed potatoes and never thought of adding cream cheese or sour cream to them, but take your word for it – sounds amazing! Hope you have a wonderful Thanksgiving! All the best to you and your family! I hope that your holidays were wonderful too, Anna and Liz! Thank you for your kind compliment and for stopping by Chiara! It is really strange when you find someone who doesn’t want to share her recipes. Maybe, for me it’s strange because I share everything through the blog. For me it’s a real satisfaction when a person tastes one of my receipes and he finds it good. It is a little bit different from the traditional Italian “purè”, but I find it extraordinary good. I agree Ilaria, that when one asks for one of my recipes, it is indeed a compliment! If your family loves them, that says it all. 🙂 Have a wonderful Thanksgiving. Thanks so much for sharing a family recipe! These are the best. I’ve never made mashed potatoes with sour cream or cream cheese, so it’s going to be fun to try something new that’s already been proven for a few generation.